Now I’m going to try out Devul for writing a blog post. I will try and get is as correct as possible with my spelling and what not. But we’ll see where it leads me. HI want to tell my story about what a difference it has made ofr me while blogging, No i mean while doing the NaNoWriMo challange. Currently I’m behind on my writing, because I have been sick and there’s alot of other things going on in my Life, it happesn we all know it. And we can’t always get what we wont. So the things -s the THing is that I need to catch up. And I calculated that I ned 33333 by the 20th of November to catch up. Not wanting to spend ”too much” time writing each day I decided that 2, correction 3 days would be the sufficient amount to catch up in decent speed. I was about 10k, bedhind. Which is roughly 3k per day, a bit more, but let’s not get down to specifics. I realised I had 1 hour left untill a new day would start and that I jhad just set myself up to write 3k words, within that hour. Oh well Since I cam nheep up a word count of k4k / hour, I thought uit would be a nice challange. I donät put much effort into spelling correclty, I aim to get the thoughts out of my head and just wite. I do some ciorrection notes while writing, if I efeel it nessessary. So I sat down and wrote, for one hour. 61 minutes to be aexact. And I wrote a whole of 3210 words in that time. At a pace of 3154 words per hour. I will put the screen shot somewhere in this post when I’ve finished writing it. Writing for a whiole hour straight will let your characters get through alot of things you might hnot have had in your mind alreayd, since most wthings I write isnät set in my head nuntil a bit into it. I get alot of ideas as I go and carry on with it. I ended upwriting myself into a trap. Which decveloped nicely, but we will see where it ends. My Male Main Character, I have 3, ended up ona business date, with one of the Female main characters boyfriend. I gues my characters decided that theyr lifes would start to get involved with eachothers by now. I reached 25k, which is haflf way, and sort of the reason why I’m writing this post. Are you halfway I asked myself, and after finishing the one hour session, I actually think I mgith jsut be half way story wise. I’ve noticed alot when writing, that I don’ät really have to think. What is going to happen just happends. And I love that. It’s surprising and I have never written in this way before ever in my life. I don’t get distracted, since I use Devil, and I can just carry on. I can decide to edit the session I’ve worked on when I’m done with it, or save it for a day when I want to go back and have minor inspiration. 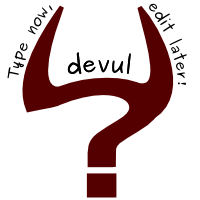 Because let it be said that editing your misspellings is a good idea, atleast if you’ve used Devil/Devul, I keep writing that wrong, ;). Oh and my random music list on Spotify managed to give me good dancing/club music just as my characters went into a club. Aint that just leovely? There are quite a few blog posts related to NaNoWriMo that I would want to write about but I think I will just pinch them in, with what I have already written and we will see if it fits. Hope you enjoyed this Devul/NanowriMo post of mine, and that you will try it out. Do not Forget to check out Flattr as well! Session: During 9 minutes, 647 words were added at a pace of 4000 words per hour.